The Bursaries Outreach Programme is now closed. Many thanks to all who have submitted their application. The Outreach Programme for the International Conference on LGBT Human Rights is a bursary system that allows selected individuals to obtain financial assistance to cover part of their expenses for participation in the International Conference. 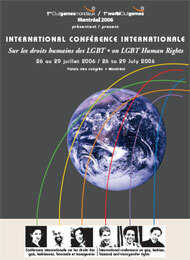 Funding for the Outreach Programme has been obtained through special fundraising events and sponsorships given to 1st World Outgames Montréal 2006. The Conference Outreach Programme has been defined in accordance with Canadian Laws, as determined by the Canadian Charter of Rights. In compliance with the Charter, the Outreach Programme has no restrictions with regard to sexual orientation, gender, race, religion, physical ability, political beliefs or HIV/ health status. Any individual who is at least 18 years of age on 26 July 2006 and requires financial assistance to attend the International Conference is eligible. At least 50% of the Conference Bursary programme will be reserved for women. The 1st World Outgames Montréal 2006 will not be held responsible for any Visas refused by Canadian authorities. Applicants must register online for the Outgames before completing the Outreach Form. Please choose your activity (Conference) and DO NOT COMPLETE YOUR PAYMENT. Applicants must complete the OUTREACH PROGRAMME APPLICATION FORM. Online, after registering for the Conference (or if you already have registered), simply go to the Registration Home Page, then click on BURSARY APPLICATION link to complete the form. Should any part of the submitted application form be incomplete or should the information contained therein be false, the applicant’s request will automatically be rejected. The Application Form must have been received no later than 1 February 2006 at midnight Eastern Standard Time to be valid. All decisions of the Bursary Selection Committee are final. Applicants that have been selected will immediately be notified. All applicants must have a valid passport and, if necessary, must apply for a visa to Canadian authorities. Applicants that will require a visa to travel to Canada should inquire about the procedures as soon as possible. More information from the Government of Canada. All recipients of bursaries will be considered registered unless denied a Canadian Visa (if applicable). Bursaries are not transferable to another person. Bursaries are not redeemable in cash. The bursary will be deemed null and void in the event that the participant cancels his or her registration for the International Conference. An application refused for the Conference Bursary Programme will automatically be disqualified for the Sport and Cultural Bursary Programme and vice versa. The Conference Bursary Programme will cover a part of the applicant’s expenses but it cannot cover all the expenses for the event. Any participant who has already paid the Conference registration fee may not apply for the registration fee bursary. After the deadline for applications (1 February 2006), the Bursary Selection Committee will review all requests. Applicants who are selected will be contacted within the 3 weeks following the submission deadline date. All applicants must have a valid passport. The selected applicants must provide proof that they are able to travel to Canada before the full benefits of the bursary will be awarded. Should a VISA be required, the applicant must provide proof that she or he is allowed entry into Canada. If needed, selected applicants will receive a letter of invitation from the 1st World Outgames Montréal 2006 Organizing Committee. Conference bursary applicants may contact Natacha Veilleux for more information or assistance.